Frederick Rein's ingenious acoustic chair, designed for King John VI of Portugal in the early 19th-century. Frederick Rein Ltd.'s catalog, displaying evolving 19th century designs. 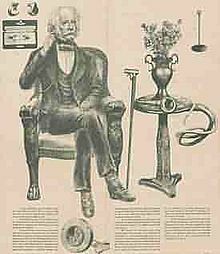 Toward the late 19th century, hidden hearing aids became increasingly popular. Rein pioneered many notable designs, including his 'acoustic headbands', where the hearing aid device was artfully concealed within the hair or headgear. Reins' Aurolese Phones were headbands, made in a variety of shapes, that incorporated sound collectors near the ear that would amplify the acoustics. Hearing aids were also hidden in couches, clothing, and accessories. This drive toward ever increasing invisibility was often more about hiding the individual's disability from the public than about helping the individual cope with his problem. A 1933 ad for early vacuum tube hearing aids. These German hearing aids date from around 1920 to 1950. They include an attachment similar to a telephone receiver. Museum of Medicine, Berlin, Germany. One of the first manufacturers of the electronically amplified hearing aid was the Siemens company in 1913. Their hearing aids were bulky and not easily portable. They were about the size of a "tall cigar box" and had a speaker that would fit in the ear. During the 1920s and 1930s, the vacuum tube hearing aid became more successful and began to decrease in size with better miniaturization techniques. The Acousticon's Model 56 was created in the mid-1920s and was one of the first portable hearing aid units, although it was quite heavy. The first wearable hearing aid using vacuum tube technology went on sale in England in 1936, and a year later in the United States. By the 1930s, hearing aids were becoming popular to the public. Multitone of London patented the first hearing aid to use automatic gain control. The same company introduced a wearable version in 1948. Military technological advances that occurred in World War II helped the development of hearing aids. One of the major advances that World War II enabled was the idea of miniaturization. This could be seen by Zenith's pocket-sized Miniature 75. This early 1980s photo shows a hearing aid with a transistor that is worn over the chest with shoulder straps. It would sometimes have a problem with static interference, even if the wearer laughed or smiled. The development of transistors in 1948 by Bell Laboratories led to major improvements to the hearing aid. The transistor was invented by John Bardeen, Walter Brattain, and William Shockley. Transistors were created to replace vacuum tubes; they were small, required less battery power and had less distortion and heat than their predecessor. These vacuum tubes were typically hot and fragile, so the transistor was the ideal replacement.The 1952 Sonotone 1010 used a transistor stage along with vacuum tubes, to extend battery life. The size of these transistors led to developments in miniature, carbon microphones. These microphones could be mounted on various items, even eyeglasses. In 1951, Raytheon manufactured the transistor and was one of the first companies to mass-produce transistors to throughout America. Raytheon realized that their hearing aid only lasted short-term and began to sell the vacuum-tube hearing aids again along with transistor hearing aids. Zenith was the first company to realize the problem with transistors was the body heat of individuals. After coming to this conclusion, the first “all-transistor” hearing aids were offered in 1952, called the Microtone Transimatic and the Maico Transist-ear. In 1954, the company, Texas Instruments, produced a silicon transistor, which was much more effective than the previous version. The end of the transistor was marked by the creation of the integrated circuit or IC by Jack Kilby at Texas Instruments in 1958 and the technique was perfected in hearing aids over the next 20 years. Some hearing aids from the early 21st century with traditional designs. Oticon hearing aids to be used with Bluetooth wireless devices. The next major milestone was creating an all-digital hearing aid. The Oticon Company developed the first digital hearing aid in 1995, but it was only distributed to audiological research centers for research on digital technology in the realm of acoustic amplification. The Senso was the first commercially successful, all-digital hearing aid, and was created by Widex in 1996. After the success of the Senso, Oticon began marketing their own hearing aid, the DigiFocus. One of the first digital chips was created by Daniel Graupe. The digital chip, referred to as the Zeta Noise Blocker, routinely adjusted the gain in the frequency channels to help control high levels of noise. The chip was integrated in a number of hearing aids in the 1980s. In addition to the Zeta Noise Blocker, there was a development of digital chips that were devoted to high-speed digital signal processing or DSP. DSP chips became available in 1982, and began to be implemented into hearing aids. By 1988, chips were produced in hearing aids. One of the major contributions of these chips was the ability to process both speech and other types of noises in real time. One major down fall of these chips was that they were massive and used up a lot of battery, which made them nearly impossible to be worn. ^ a b c d e f g h i Howard, Alexander. "Hearing Aids: Smaller and Smarter." New York Times, November 26, 1998. ^ a b c d e f g h i j k Levitt, H. "Digital hearing aids: wheelbarrows to ear inserts." ASHA Leader 12, no. 17 (December 26, 2007): 28-30. ^ a b c d e f g h i j k l m n o Mills, Mara. "Hearing Aids and the History of Electronics Miniaturization." IEEE Annals of the History of Computing 33.2 (2011): 24-44. 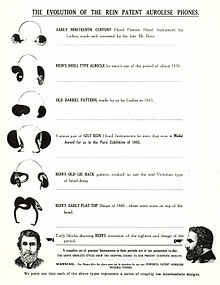 ^ "Concealed Hearing Devices of the 19th Century". ^ James Wilbur Hall (1998). Audiologists' Desk Reference: Audiologic management, rehabilitation, and terminology. Cengage Learning. p. 5. ^ a b K., W. (1953, Apr 19). Transistors in need of improvement. New York Times (1923-Current File), pp. E9. ^ Berger, Kenneth. "Hearing Aid Museum ." Kent State University Excellence in Action. http://www.kent.edu/ehhs/spa/museum/history.cfm (accessed May 15, 2011). ^ Apple, Inc. "Made for iPhone Hearing Aids" https://www.apple.com/accessibility/ios/hearing-aids/ (accessed January 28, 2016). ^ Jacoti, BVBA, "Jacoti ListenApp" https://www.jacoti.com/listenapp/ (accessed January 28, 2016). Berger, Kenneth. "Hearing Aid Museum ." Kent State University Excellence in Action. http://www.kent.edu/ehhs/spa/museum/history.cfm (accessed May 15, 2011). Howard, Alexander. "Hearing Aids: Smaller and Smarter." New York Times, November 26, 1998. K., W. (1953, Apr 19). Transistors in need of improvement. New York Times (1923-Current File), pp. E9. Levitt, H. "Digital hearing aids: wheelbarrows to ear inserts." ASHA Leader 12, no. 17 (December 26, 2007): 28-30. Mills, Mara. "Hearing Aids and the History of Electronics Miniaturization." IEEE Annals of the History of Computing 33.2 (2011): 24-44. "Deafness in Disguise: Concealed Hearing Devices of the 19th and 20th Centuries". Washington University School of Medicine. 15 June 2009. Retrieved 4 December 2011. This page was last edited on 25 February 2019, at 02:42 (UTC).